As people who read me regularly know, it takes a lot to get me to see a remake of a movie I deemed very good or better because I find that it is usually A). Pointless. and B). Almost certain to disappoint. The instances where a remake turned out better than a good or great original have been few. I hadn't established this rule when I saw 1978's Heaven Can Wait starring Warren Beatty, co-written by Beatty and Elaine May and co-directed by Beatty and Buck Henry. 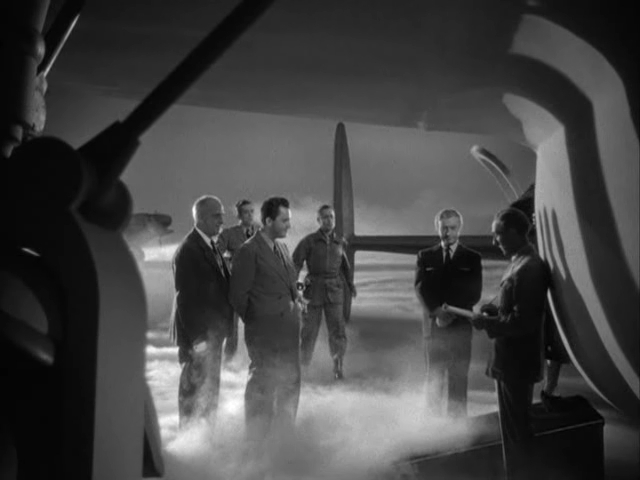 At the time, I didn't even know it was a remake of 1941's Here Comes Mr. Jordan, which marks its 70th anniversary today. Those two films mark a rare time when the original and its remake nearly equal each other in quality (The third time was not a charm when Chris Rock tried to re-do it as Down to Earth). Today, we celebrate Here Comes Mr. Jordan on its birthday and watching it again, the movie continues to hold up, though I admit that Beatty's version bests it in some areas. 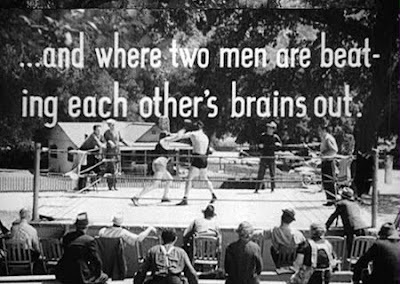 After the literal punchline, we meet boxer Joe Pendleton (Robert Montgomery) as he finishes his sparring match and climbs out of the ring to speak with his manager Max Corkle (James Gleason). Max has news for his prized fighter — it appears that he has finally managed to get Joe a chance at the world title with a bout against the current champ, only they'll have to leave their ideal New Jersey training camp immediately and hop the train to New York. Pendleton can't wait to leave, but he'll meet them there — it will give him some time for his hobby — flying his plane. 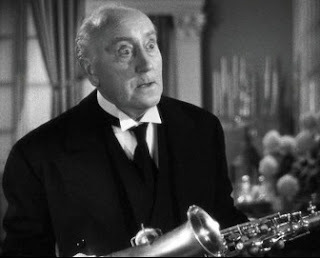 Corkle begs him not to fly, but Joe tells him not to worry, he will have his lucky saxophone with him, which he begins playing much to Corkle's annoyance. Joe takes to the air, lucky sax with him. 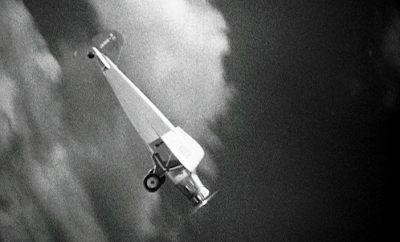 He even tries playing it and flying at the same time — until part of the plane starts to rip apart. He puts his sax down and tries to regain control of the aircraft, but it's too late — the plane spirals to earth and crashes. 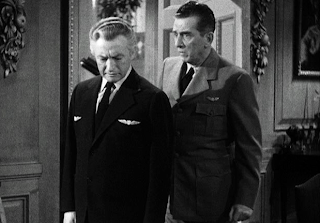 With the impact with which the plane hit, leaving nothing but crumpled wreckage, it's understandable that someone such as Messenger 7013 (the always delightful Edward Everett Horton) would presume Pendleton was toast. Unfortunately, 7013 is new to his job as an afterlife guide and this is his first assignment. He breaks a cardinal rule: He removes Joe's soul before it's confirmed that he would have died in the crash. 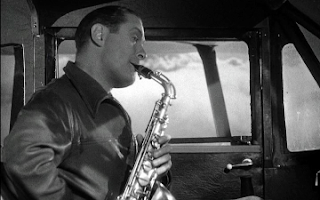 So, when Joe, still clutching his sax, and his guide arrive in the cloud-strewn weigh station where the newly dead board a plane to their final destination, Joe protests quite adamantly that he isn't dead. He's in great shape "in the pink," as he says. 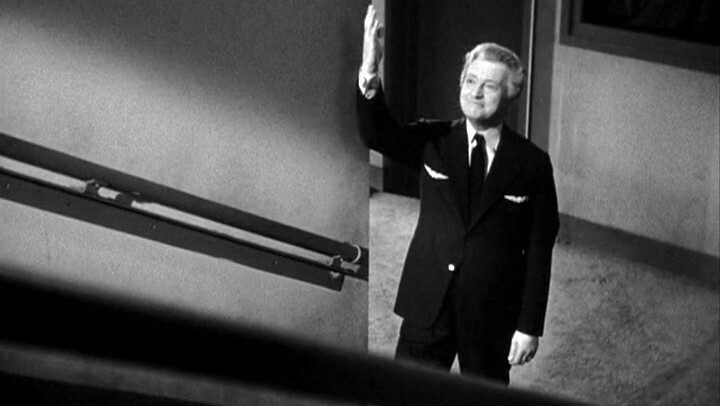 His assignment annoys 7013 quite a bit and he's making so much noise that he's attracted the attention of the man in charge of the weigh station, Mr. Jordan (Claude Rains). When Jordan finds that Pendleton isn't on the list of new arrivals, he has the plane's co-pilot (a young Lloyd Bridges) radio for information on when Joe Pendleton was due to arrive. The information comes back: Joe would have survived the crash. He wasn't scheduled to die until 1991. (Robert Montgomery almost made that in real life: He died in 1981.) Jordan chastises 7013 for being premature and decides to handle Joe's case himself: They'll have to return him to his body. Easier said than done. When Mr. Jordan and Joe arrive at the crash scene, his body already has been retrieved, so he's been discovered and likely declared dead. Joe suggests they find Corkle so they head to New York, passing a newspaper boy touting the news of his death in a plane crash. When they get to Max's apartment, a devastated Corkle greets mourners, including a group of neighborhood kids saying what a swell guy Joe was. 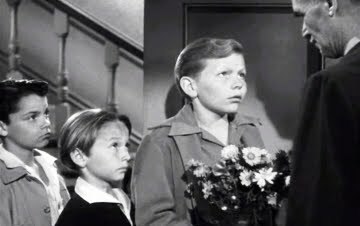 They'd been planning to take flowers to where Max says they took Joe, but couldn't remember what he called it. "Crematorium," Max reminds them. Uh-oh. Not only has Pendleton's death been reported already, his body no longer exists for Mr. Jordan to re-insert his soul even if a resurrection could be rationally explained at this point. Joe demands satisfaction for this screwup — they owe him 50 more years of life — so Mr, Jordan proposes that they find another body for him. Inside, he'll still be Joe Pendleton, but on the outside he'll take on another person who was due to die's identity. Joe does have some demands: He was on the verge of getting a shot at the world boxing title so whatever body they find has to be in shape so he can accomplish the same task. After previewing countless bodies around the world, none of which meet Joe's standards, Jordan takes him to yet another one, saying he thinks this one might be promising. Pendleton reminds him again that he needs to be in good physical condition because, "I was in the pink." Jordan, who seems an extremely patient sort, has grown tired of finicky Joe, particularly this phrase. "That is becoming a most obnoxious color. Don't use it again," Jordan tells him. They are outside the gates of a mansion. Jordan explains the wealthy banker inherited his fortune and his name is Bruce Farnsworth (though it was changed to Leo in Heaven Can Wait because in the '70s, no one liked the name Bruce for some reason. Just ask TV's The Incredible Hulk). Jordan sits down at the piano and calmly starts flipping through sheet music. Joe asks where this Farnsworth is and Jordan explains he's upstairs being drowned to death — murdered by his wife and personal secretary. Joe goes nuts. Shouldn't they be calling the police? Jordan has to remind him again that no one can see or hear them. Joe already has made up his mind not to take a body that's mixed up in murder and they should skedaddle, but Jordan has to wait and collect Farnsworth, regardless of whether Joe accepts his body or not. Jordan stops looking through the music and turns and faces Joe. "It's over," he says, indicating that Farnsworth is dead. Jordan, though he works on Heaven's side, does have a bit of devilish manipulation in him (as Rains always played so well, and would five years later as the devil himself in another film from a story by Harry Segall, Angel on My Shoulder). Until Farnsworth's body is discovered, Jordan still has time to talk Joe into taking his body. They eavesdrop as the co-conspirators come downstairs and the personal secretary Tony Abbott (John Emery) tries to calm the nerves of Farnsworth's wife Julia (Rita Johnson), reassuring her that they won't be caught and that Bruce certainly is dead. Watching Here Comes Mr. Jordan this time, it's impossible not to say that Heaven Can Wait certainly did a better job in the casting of Abbott and Julia. It isn't that Emery and Johnson are bad, but their characters are far less important in the original film while in the remake when the parts were placed in the very capable hands of Charles Grodin and Dyan Cannon, not only were the roles beefed up, they also were hilarious villains. Emery and Johnson play straight-faced villains for the most part whereas Grodin and Cannon added to the comic ensemble. You're laughing as they botch attempt after attempt on Warren Beatty's Joe Pendleton. 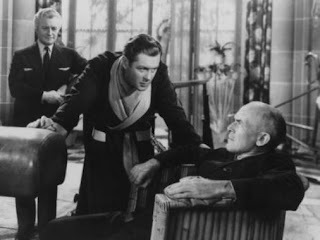 Back in the 1941 version, while Robert Montgomery's Joe finds it interesting that he can listen in on these newly minted murderers, he also finds it frustrating that he can't punish them somehow. He asks Mr. Jordan what happens if these two killed him again. Won't he be in the same predicament he's in now? Jordan describes the human body as nothing more than an overcoat. What makes a person who he or she really is resides inside. "A soul is never lost, no matter what overcoat you put on," Jordan tells Joe. 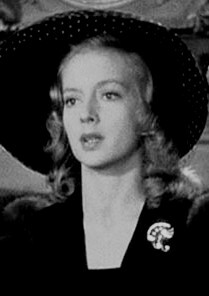 Then, the game changer enters in the form of a beautiful woman (Evelyn Keyes) asking to see Mr. Farnsworth. Now, Joe is intrigued. Her name is Bette Logan (when Julie Christie played the role in Heaven Can Wait along with many of her details being changed to explain her British accent, they also changed the spelling of her first name to Betty for some reason) and she wants to see Farnsworth because her father has been accused by the currently dead tycoon in a stock swindle that Farnsworth himself perpetrated and framed Bette's father for, putting the man behind bars. 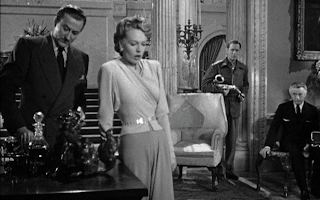 Bette knows her father is innocent and wants to plead to Farnsworth to look personally into the story and help prove that he didn't steal anything from him. At first, Abbott and Julia act quite sympathetic to Ms. Logan, mainly because Abbott has whispered to Julia before the butler Sisk (Halliwell Hobbes) showed her in that she'd help their story if they are meeting with her when Farnsworth's body is found. 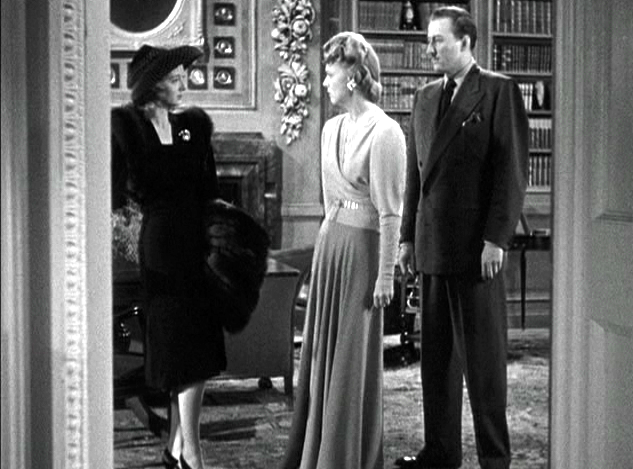 Joe and Jordan serve as invisible witnesses to Bette's story and it touches Pendleton, who tells Jordan he wishes he could help her. Jordan tells Joe he can — if he becomes Bruce Farnsworth. Joe stays on the fence, but that's when Abbott sends Sisk upstairs to fetch the dead man. Jordan reminds him that there isn't much time to decide now. As Sisk heads upstairs, Abbott and Julia turn on Bette, saying her father is guilty of all of which he is accused. Joe asks Jordan if he can just use Farnsworth's body long enough to help Bette and then find a body in better shape. Jordan agrees and before he knows it, the two are upstairs in Farnsworth's bathroom. Jordan wraps a robe around Joe as he climbs out of the tub, but Pendleton looks in the mirror and still sees himself and when he opens his mouth, he sounds the same. Sisk knocks on the door, asking if he's OK. Jordan assures Joe that he only looks and sounds the same to himself. The rest of the world will see and hear him as Bruce Farnsworth. Joe answers Sisk that he'll be out in a minute and Sisk doesn't appear suspicious. Pendleton remains worried as he leaves the bathroom wearing the robe, obviously too big for his body. He almost marches straight downstairs until Sisk reminds him what he is wearing and that perhaps he should get dressed first. Then Sisk notices something he's never seen before and asks his employer if it's his. Of course, Pendleton says, taking his lucky sax. Once Sisk has helped dress Joe/Farnsworth in what appears to be a more dapper-looking robe, he heads downstairs, much to the shock of Abbott and Julia. 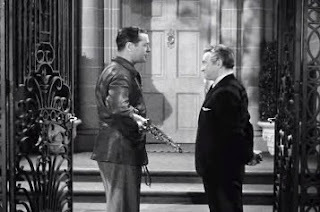 If the conspirators weren't confused enough that he isn't dead, they become downright dumbfounded when he starts speaking to Bette in a friendly tone and indicating that he's sure they can solve her problem. Abbott, who's aware that Farnsworth committed the crime himself, steps in and tries to scuttle the inroads Joe tries to make until a frustrated Bette leaves. 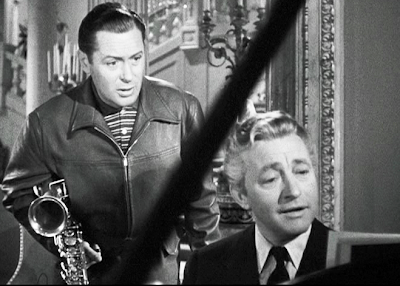 Joe orders Abbott and Julia out of the study so he can practice his saxophone. When they exit, he consults Mr. Jordan, dejected because Bette hates him but Jordan tells him to give it time. Then Joe sets out to get to work on his other project — getting Farnsworth's flabby body into fighting shape and he's going to need Max Corkle for that. Gleason most decidedly deserved his Oscar nomination as Corkle. He was another in the seemingly endless line of dependable character players of the 1930s and '40s, usually in comedies, but he never seemed to let the moviegoer down even if he was in a film that did. 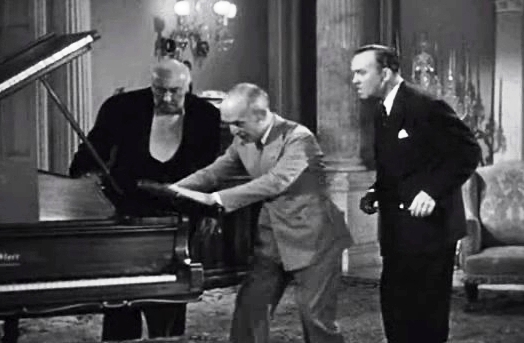 He's joined in Here Comes Mr. Jordan with another example in Edward Everett Horton, but his role is a rather small one and doesn't equal the best of his work from the 1930s. Then of course, they've got the versatile Claude Rains along too, who could seemingly do it all — lead or supporting — in every possible genre: comedy, drama, action, adventure, horror, you name it. 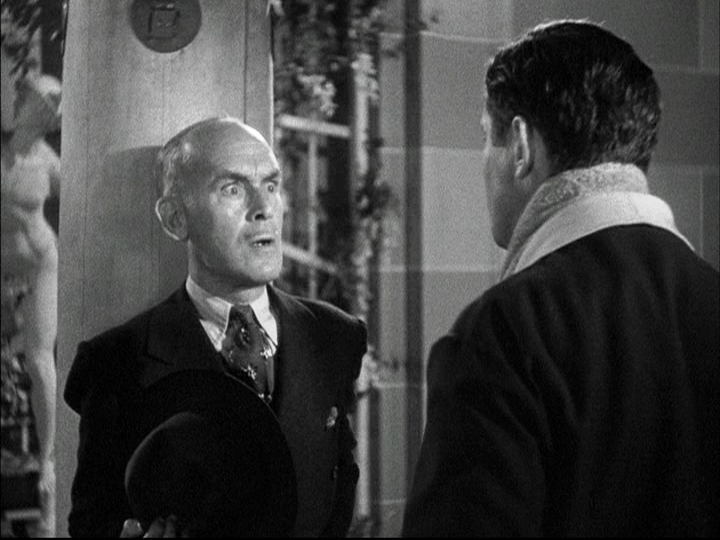 However, Here Comes Mr. Jordan is Gleason's time to shine, earning him his sole nomination the same year he was one of the best parts of Capra's Meet John Doe. 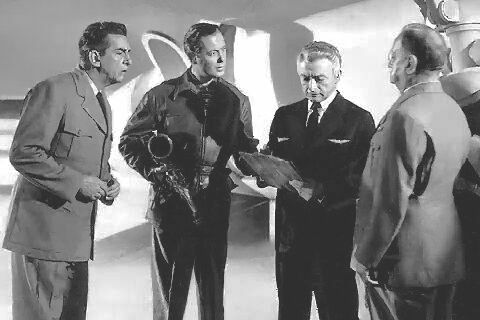 His career lasted well into the late '50s, including Charles Laughton's sole directing effort The Night of the Hunter with arguably Robert Mitchum's most indelible role and his penultimate film was John Ford's great political drama The Last Hurrah starring Spencer Tracy. 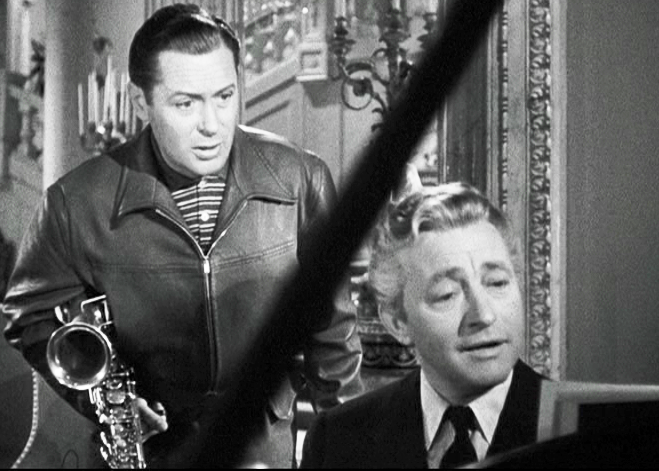 Gleason also has some credits as a director and a writer (which unfortunately includes being responsible for the dialogue in my choice for the worst best picture winner of all time, The Broadway Melody). The scene where Corkle shows up at the Farnsworth estate — and nearly gets kicked out by Abbott who doesn't know why he's there, not that Max does either — is a comic highlight as Joe inside Farnsworth's body works overtime to convince his manager that he really is Joe Pendleton and not some insane rich guy. Corkle is just convinced Farnsworth is a nutjob, especially when he begins talking to the invisible (to Max anyway) Mr. Jordan asking how to convince him. Finally, Joe thinks of the obvious and pulls out the sax. Max starts to believe. Joe explains he wants to get ready to get back in the ring, but he needs him to train him. He even promises to give Corkle 40 percent of whatever he wins. This is another area where Heaven Can Wait makes a bit more sense. Farnsworth would still have to fight his way up to get near the championship. It's a little less ludicrous when Warren Beatty's Farnsworth simply buys the football team and makes himself a player on it, but then Montgomery's Farnsworth won't have to worry about any bouts. As Corkle continues to try to believe what he's heard, Sisk interrupts to announce that Ms. Logan has returned, so Joe excuses himself for a moment and it's funny as Gleason's Corkle talks to the now-departed Jordan and feels around to see if he's there. Needless to say, not only does Joe as Farnsworth get Bette's father off the hook, the pair fall in love as well. Bette worries, since Farnsworth has a wife, but Joe tries to explain the state of their relationship. He can't go into his real identity since she wouldn't know who Joe Pendleton is and saying that Julia and Abbott tried to kill him has risks as well, so he just leaves it as they are separated and she's cheating on him. He's very unhappy one day when Messenger 7013 shows up, telling Joe that it's time to exit Farnsworth. He orders him out, telling him he's "always gumming up the works." Now that he loves Bette, he's fine with Farnsworth. Mr. Jordan returns and reminds Joe that he asked to use Farnsworth on a temporary basis. Joe ignores him and proceeds to make a phone call until a shot is heard and he falls to the floor, but he's fighting. Jordan has to coax him into leaving Farnsworth's body before it's too late. Abbott and Julia are thrilled that it worked this time and hide his body. Bette is beside herself, Corkle can't believe it's happened again, commenting that "Forty percent of a ghost is forty percent of nothing" and a new character, Inspector Williams of the police department (Donald MacBride) starts investigating Farnsworth's disappearance since Corkle tells him that Abbott and Julia killed him once before, but since he phrased it that way, Williams suspects Corkle may just be a kook. 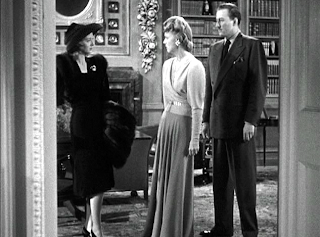 Max remains persistent while Abbott and Julia try to point suspicions at Bette, even though her father was cleared. The inspector just gets frustrated with the nonsense. Even if you haven't seen Here Comes Mr. Jordan or any of its remakes, good or bad, you probably have a good idea how things resolve themselves and while both it and Heaven Can Wait pack plenty of laughs for most of their running times and the romances in both films are rather run-of-the-mill, they still manage to be quite touching in their final moments, not just in the resolution of Joe and Bette/Betty but even more so with the realization that when Joe gets placed in his permanent body, his Pendleton memories are lost and both James Gleason and Jack Warden perfectly captured that bittersweet moment for Max Corkle in their respective films. Admittedly, for a film I enjoy as much as I enjoy Here Comes Mr. Jordan, I never remember who directed it. Even when I see the name Alexander Hall, it rings no bells. Only one other title on his filmography sticks out and that's Rosalind Russell in My Sister Eileen. I have seen the last film he directed and it's somewhat ironic that it's that one. It's the 1956 Lucille Ball-Desi Arnaz vehicle Forever, Darling where Ball's character gets advice from a guardian angel who takes the form of her favorite actor, James Mason. I only saw the film because I was working on my centennial tribute to Mason back in 2009. Otherwise, I can't imagine any other circumstances that would have made me watch it, but it is funny that the final film Hall helmed featured Mason as a guardian angel and then 22 years later Mason would play Mr. Jordan, another character from above, in Heaven Can Wait. Mason is very good in the role, but for me, there is only one Mr. Jordan. Excellent look at this one, Ed. I do love the original and the remake, for different reasons. I saw the remake first and eventually caught the original on TV (while home sick watching local channel running movies). It's a very special film. Thanks.